I have laughed my way through the seasons. Now I’m on season 8. Eeep! If you’ve never watched Supernatural, then um … leave now! It’s a pretty great show, if by any indication from the above GIF. After their mother’s death in a suspicious fire, Sam and Dean Winchester live a life on the road with their father as they grow up. Years pass and the boys team up to find their father, John Winchester, who went missing on a hunting trip. However, their father is not a typical hunter, he hunts supernatural creatures like ghosts, vampires, and spirits and he’s trained his sons to do the same. Along the way, Sam and Dean save innocent people, fight creatures and ghosts, and collect clues to their father’s whereabouts. Sam begins to mysteriously develop psychic abilities and visions as they travel. They eventually find their father, who reveals that the creature that killed Sam and Dean’s mother years earlier is Yellow-eyes and the only thing that can kill him is a legendary gun created by Samuel Colt. The season follows Sam and Dean Winchester as they deal with their father’s death and continue to hunt the Yellow-Eyes, who caused the fire that led to the deaths of their mother and later, Sam’s girlfriend, Jessica Moore. They have assistance from new allies Ellen, Jo, and Ash. Part of Yellow-Eyes’s master plan is eventually revealed as he gathers Sam and others like him, leading to Sam dying. Dean makes a deal in the crossroads to bring back Sam in exchange for his soul, which will be collected in one year. In a final confrontation, in which Dean kills Yellow-Eyes, a gate is opened, releasing fury from within. The season mainly focuses on trying to save Dean Winchester from his deal and tracking down the fury that was released from the gate. 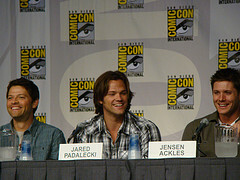 Along the way, the brothers meet Ruby, who has an interest in Sam Winchester and claims to be able to help save Dean. Also, they meet Bela Talbot, an acquirer and seller of occult objects, who is constantly a thorn in their side. The brothers eventually learn what demon holds Dean’s contract, a being of great power named Lilith. The brothers, along with Ruby, track her down and attempt to kill her. Lilith is unable to stop Sam due to his mysterious abilities, however, Dean’s contract expires and his soul is taken. Dean Winchester is rescued from Hell and brought back by a mysterious angel of the lord named Castiel, one of several angels who appears throughout the season. The rest of the season follows the brothers as they work with Castiel to stop Lilith’s plan of breaking the 66 Seals, which would allow the fallen archangel Lucifer to walk the Earth free once again. Sam and Dean’s relationship is also strained as Sam starts siding with Ruby over Dean. He also begins to give into his demonic side by drinking demon blood to become strong enough to defeat Lilith. After tracking down and killing Lilith, Sam learns her death is actually the last seal and Ruby was deceiving him all along. Dean arrives too late to stop him, but kills Ruby as Lucifer’s prison opens up beneath them. The fifth season revolves around the fight to stop Lucifer and save the world from the Apocalypse. Throughout the season, after Sam and Dean Winchester learn the Dean is the true vessel of the archangel Michael, the boys battle both angels and demons as they fight their destiny to become the vessels of both Michael and Lucifer while Castiel helps them out and also searches Earth for God. Unable to defeat Lucifer, even with the Colt, with their trusted angel friend Castiel, and even after learning the God won’t help, they collect the rings of the Four Horsemen of the Apocalypse, which act as the keys to Lucifer’s Cage, to put him back in his cell thanks to the info from the Trickster, revealed to be the archangel Gabriel and help from the demon Crowley. The idea of destiny versus freedom and choice plays a large role. Throughout the season, Dean, Sam, Castiel, and Bobby Singer each have a crisis as they near giving up. However, through each other’s support, they continue forward until the end. Castiel rebels against Heaven for Dean in this season. It is also notable that Bobby and Castiel have an ongoing friendship during this season, while Dean and Sam grow further apart. The sixth season begins a year after the end happenings of the fifth with Dean Winchester living a happy life with Lisa and Ben Braeden. Sam returns to the world of the living and teams up with Dean, who leaves his new life behind. Sam Winchester has been working under Samuel Campbell in order to hunt and capture alive Alpha monsters (first of the gene pool). Castiel is barely helpful anymore because the civil war against the archangel Raphael in Heaven has taken its toll. It is discovered that Samuel is following Crowley’s orders in exchange for the return of his daughter. Crowley wants to use the Alphas to locate Purgatory, in which there are a vast collection of souls that could be used for power. Castiel brought back Sam without his soul, and Dean implores the help of the Horseman of Death in order to retrieve it. Death puts a wall up in Sam’s mind so that he will not remember Hell. The old Sam returns with no memory of the past year. It turns out Castiel made a deal with Crowley for each of them to receive half of the souls in Purgatory. Dean doesn’t like the idea and tries to stop the duo. To stop the Winchester brothers and Bobby Singer, Castiel knocks down the mental barrier in Sam. Castiel betrays Crowley, Crowley becomes allies with Raphael and performs the ritual to open the doors of Purgatory. It fails because they had fake dog’s blood and Castiel appears full of power from having done the ritual himself. He obliterates Raphael and Crowley escapes. When the Winchesters try to talk Castiel into reason, he reveals that he is not an angel anymore, he has become the new God. In season seven, the Winchesters will find themselves in an increasingly sinister, changing landscape, up against a new foe unlike anything they’ve ever fought: the Leviathans, the first beasts ever created by God. They’ll find their old tricks, weapons and hiding places all rendered useless. All they’ll have is each other. And the certainty that, like the last of the cowboy outlaws, whatever they face, they’re not going down without a fight. Season seven finds Dean and Sam reeling from the loss of their friend. Sam’s violent memories of Hell threaten to overtake him, threatening not just his life, but his brother’s as well. Meanwhile, Dean struggles under the weight of a secret that threatens to tear them apart. And even as the brothers traverse the backroads of America, hunting things that go bump in the night, something is coming for them. They are about to face an enemy more cunning and adaptable than any they’ve ever fought. As the landscape around them becomes increasingly treacherous, the tools they’ve come to rely upon will be stripped away. Our heroes, like so many outlaws before them, will find themselves utterly outmatched and outgunned, with no one to rely on but each other. Season Eight begins with Dean’s seemingly impossible escape from Purgatory, though Castiel is nowhere to be found. However, Dean is not alone. He’s returned with a mysterious vampire comrade-in-arms whose reason for escape is perhaps more than Dean bargained for. Meanwhile, Sam finds himself reconciling the life he discovered while Dean was gone with Dean’s sudden reappearance. As the boys struggle with their unexpected reunion, they make a shocking discovery that could lead them on a deeply personal mission to settle old scores. When Castiel returns from Purgatory, it is revealed that he was rescued by a number of angels who were sent by a mysterious but powerful angel named Naomi, who is apparently the new Commander of Heaven and has control over Castiel since she got him out of Purgatory. Season 9 – Well … I’m not quite sure what’s going to happen in this season, but I CANNOT wait! Eek! Plus there is the joy of watching these studs! Sometimes I wonder how I get by with my frustrations! Anyone else? (Like anyone’s reading this) Here I am trying to start a bog, but all I run into are state-sized problems. … Well, state-sized to me. The Goodreads widget is not wanting to work for me. I really don’t know if anyone else is having this problem, or if I’m just too blonde to get it to work for me. I’ve placed the widget where I want it. I’ve typed in my number from goodreads it asks for. … Still, nothing. Oi. I am sure if I had The Doctor here, he would know what to do. And If he didn’t, then I’m sure he would wave his little sonic screwdriver at the webpage and all would be well. Then he would walk back to the TARDIS and ask me if I wanted to travel with him and REALLY have something to blog about. Don’t mind me. I’m just ranting away. I tend to do that. Quite often, actually.